Five Placer United Gold teams finished up the 2015-16 season this past weekend at the Players College Showcase in Las Vegas. This event is one of the biggest college recruiting showcases of the season with over 300 colleges represented. The U15 age groups and under play in a tournament format and the U16 and above play in a showcase format (4-game guarantee with winners decided on points). In the final event of their Placer United careers, the U18 Gold team won three games and tied one to win the Alladin Championship. The girls opened up the event with a 1-0 win over Wolfpack and then drew with Santa Barbara Soccer Club, 0-0. In game three, Placer defeated San Diego Surf 2-0. 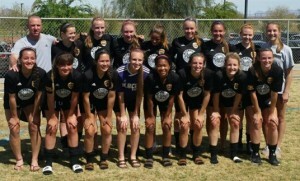 Playing for the championship, the girls pulled off a 1-0 win over the CDA Slammers to claim the title. Congrats to the U18’s on a great event, season and career with the black and gold. The U14 Gold team made it all the way to the semi-finals of the Circus Circus division. They opened up with a 0-0 draw with the Arsenal FC. In game two, the girls had a convincing 2-0 win over Tucson Soccer Academy Red. Game three had plenty of drama as the girls needed to post a victory to have a chance at the semi-finals. The score was level at 1-1 with a few minutes remaining when Placer scored the game winner. After looking at all of the results, the girls were level in tie breakers with Arsenal so penalty kicks would decide who would move on. Placer United prevailed and moved on to the semi’s where they fell 2-1 to SF Academy. The U15 Gold team also made it to the semi-finals after a great run through group play. They opened up with a 0-0 draw with CDA Slammers and then followed that up with a 5-1 win over the Livermore Fusion. Needing a win on Saturday morning to make it to the semi’s, the girls had an amazing 3-0 win over Black Diamond from Utah. In the semi-finals, Placer led 1-0 for the entire game before giving up the equalizer with just a few minutes to play. The game then went to penalty kicks and the girls came up on the short end. The U16 Gold team had two wins against Lonestar from Texas and FC Portland. They came up on the short end versus Del Sol and ISC Gunners. 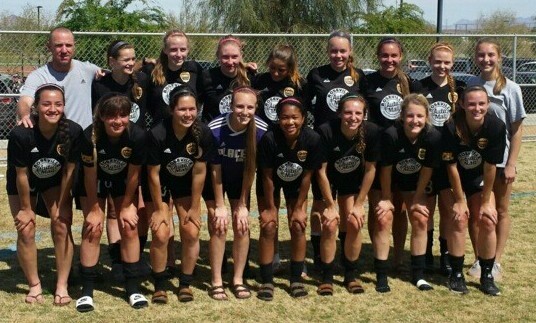 The U17 Gold team had two draws versus Albion and Utah Celtic and two close losses versus Surf and Slammers. Congrats to all of the teams on a great event and a excellent season!